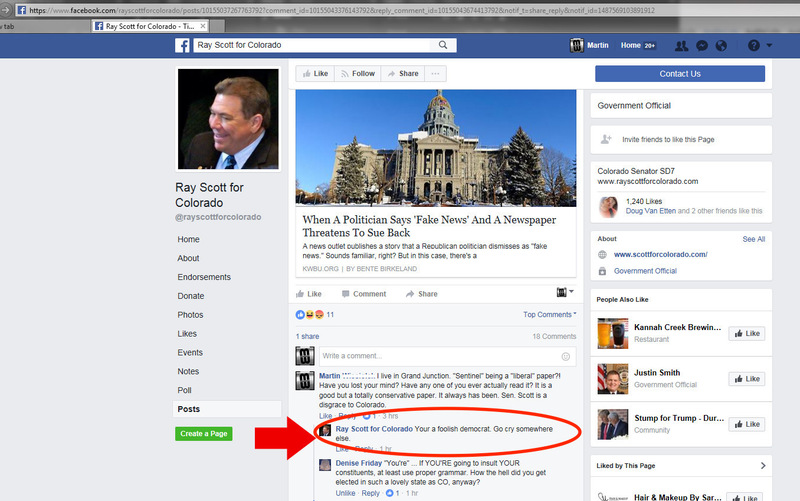 Not only has Colorado State Senator Ray Scott shocked participants on his social media accounts with consistent grammatical and spelling errors and frighteningly superficial knowledge of environmental issues, but he is particularly nasty toward constituents with whom he disagrees politically. That is, before he blocks them from his social media completely, which, according to a federal court, is against the law. Scott also often deletes his rudest comments, perhaps realizing too late he’s gone beyond the pale. But this, too, is impermissible because all entries on Senator Scott’s social media — whether they are his own or from citizens — are part of his official public record and as such must be preserved. What you post on the internet even briefly, though, is forever and thanks to screencaps can be preserved for all time. 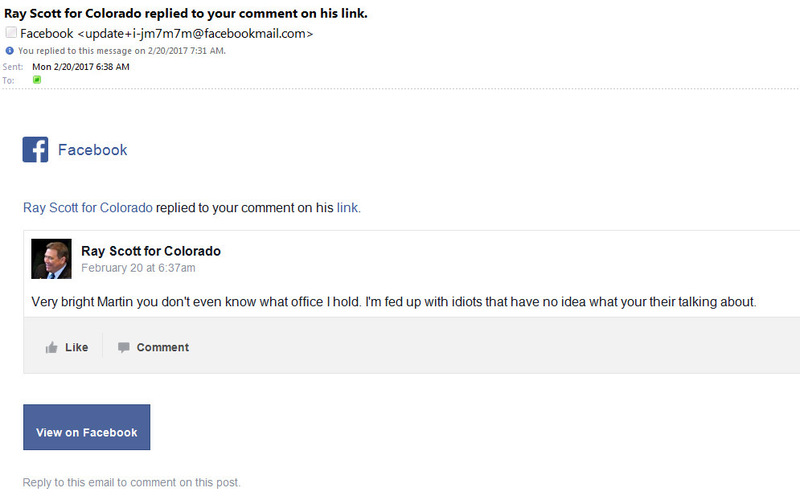 A Grand Junction resident shared with AnneLandmanBlog screencaps of several rude responses he’s gotten from Senator Scott. We know these come direct from Senator Scott because they were made under his name “Ray Scott for Colorado,” which is his official Facebook name as senator, and they contain his trademark grammatical and spelling errors. Senator Scott went further after this and blocked this constituent from his Facebook account, an act that a federal court ruled on July 25, 2017 violates the First Amendment to the U.S. Constitution (pdf). Response from Senator Ray Scott on Facebook in which Scott says he is fed up with “idiot” constituents who “have no idea what your their (sic) talking about.” Note Scott’s trademark spelling error. Ray Scott, using his trademark poor spelling, insults a constituent who disagrees with him on his official Facebook page saying “You foolish democrat (sic). Go cry somewhere else.” He then blocked the constituent. Jesus Claudette. I feel like chopped liver. Because it was only the Daily Sentinel that banned me (and several others) from their on line forum for being “dismissive”. Now, you’ve known me for a number of years Claudette? Have you ever known me to be “dismissive”? Say you don’t think it could have anything to do with my Tea Party affiliation? Yeah, that’s it, that’s the ticket. The staff and management at the Daily Senile don’t drink tea. But they damn sure swill that Koolaid. 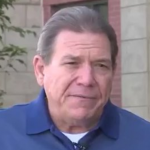 And if you ever have a message that you’d really, really, really like to get to Ray Scott, send it to me. I know people. And believe you me, he’ll get the message that you know people.